I read with great interest a comment made by one of Daily Express readers published on July 22, 2012. If you still have your weekend copy, you can find it in the forum section. Just to clarify, SEB is Sarawak Energy Berhad, not as quoted, and it is the holding company that owns SESCO which generate, transmit, distribute and supply electricity throughout Sarawak. In a way, SEB is like TNB while SESB is like SESCO. But, leaving the organisational structure alone, every utility company has the same responsibility, that is to give the utmost care and service to its customers. After all what is quality if the bar on customer satisfaction is never reached. I will leave it to you the readers to decipher the above information but to be fair to SESB, they did apologise promptly the next day during the 30 April 2012 massive power outage. The press release to offer the consumers thorough explanation was made much later and I suppose the writer was refering to this one when quoting '24 days after the event'. Furthermore, 'Other event' should include a consequential load shedding excersice many hours after the initial 16-hours power outage on April 30. SESB was struggling to stabilise the power supply to a number of bigger consumers in the West Coast, particularly in Tuaran area. In our case there were places (end users) that had their power supply normalised (totally) the next day. Capacitive Voltage Transformers, CVT, contrary to what SESB mentioned in its press release, can cause little disruption to the supply of power. We know that SESB is continuously upgrading its transmission/generation capacity, but we perceive here that compared to Sarawak and West Malaysia, it still has a lot to catch up. Excess in power generated does not guarantee fail-safe operations. SESCO has ample safety margin in its power generation capacity but other factors will still cause outage. Note however, that they will have the luxury of better back up from other sources. Hence, the lesser power disruptions. I have this nagging feeling that we in Sabah are 'fire fighting' rather than doing Planned Preventive Maintenance. The SEB case showed that we can carry out maintenance (unplanned emergency, or planned parts replacement) without putting the whole power network out of service. In other words, don't put the whole State without power just because of one small equipment failure. A copy of the SESB press release pertaining to the massive power outage has been stored in this blog for future reference. Let's hope for a blackout-free weekend ahead. **UPDATE**: Responses by SESB as well as the general public - in the internet or print media - will be quoted/recorded in the Comment section. Do check it out. SESB responded to a claim in the Daily Express. A claim that the SESB issued a press release 24 days after the April 30 power disruption was inaccurate and could confuse consumers, the agency said. 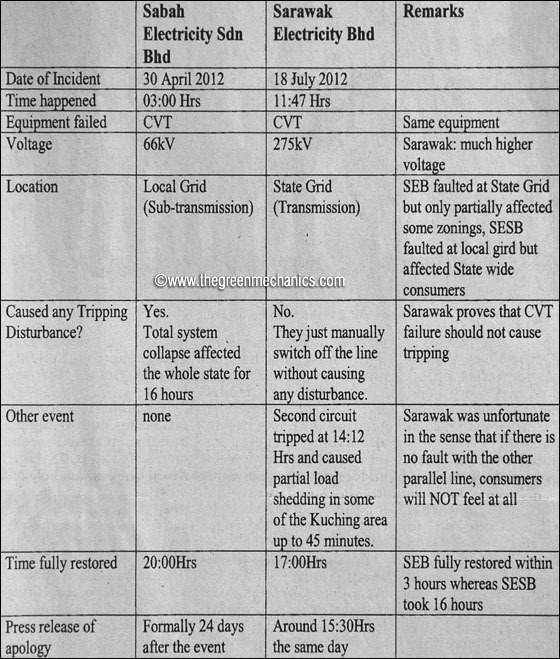 SESB, in a statement on July 25, said a press conference was held on the same day (April 30, 2012) to explain the initial investigation on the cause of the power disruption throughout Sabah and Labuan. The press conference was also aired on several radio and television stations on the same day while local and national print media published the report on the following date on May 1.